^ 1.00 1.01 1.02 1.03 1.04 1.05 1.06 1.07 1.08 1.09 1.10 1.11 1.12 1.13 1.14 1.15 Fischer, Benjamin B. The Katyn Controversy: Stalin's Killing Field. Studies in Intelligence. [2005-12-10]. ^ Katyn documentary film. Wajda.pl. [2010-03-19]. ^ 3.0 3.1 3.2 Sanford, George. Katyn And The Soviet Massacre Of 1940: Truth, Justice And Memory. Routledge. 2005. ^ 4.0 4.1 4.2 4.3 4.4 4.5 4.6 Kużniar-Plota, Małgorzata. Decision to commence investigation into Katyn Massacre. Warsaw: Departmental Commission for the Prosecution of Crimes against the Polish Nation. 2004-11-30 [2010-04-10]. （原始内容存档于2005-05-27）. ^ Ustawa z dnia 9 kwietnia 1938 r. o powszechnym obowiązku wojskowym（1938年4月9日强制兵役法案）. Dziennik Ustaw. 1938, 25 (220). （原始内容存档于2007年9月28日）. ^ 6.0 6.1 6.2 6.3 6.4 6.5 Zawodny, Janusz K. Death in the Forest: The Story of the Katyn Forest Massacre. University of Notre Dame Press. 1962. ISBN 0-268-00849-3. ^ 7.0 7.1 7.2 7.3 苏共中央政治局会议纪要第13号摘录（1940年3月5日枪决命令）. 1940-03-05 [2010-04-10]. （原始内容存档于2008年5月5日）. ^ Russia to release massacre files. BBC News. 2004-12-16. ^ Roberts, Geoffrey. Stalin's Wars. Yale University Press. 2006: 171. ISBN 0300112041. ^ BBC International Reports （Former Soviet Union） March 11, 2005, 存档副本. [2006-12-24]. （原始内容存档于2007-06-25）. ^ "Russian, Polish Leaders To Mark Katyn Anniversary". RFE/RL, 07 April 2010. ^ 14.0 14.1 A statement on investigation of the "Katyn crime" in Russia 互联网档案馆的存檔，存档日期2011-06-05. by the "Memorial" human rights society. Retrieved 31 January 2009. ^ （波兰文） Encyklopedia PWN 'KAMPANIA WRZEŚNIOWA 1939'. Retrieved on 10 December 2005 互联网档案馆的存檔，存档日期2005年9月27日，. ^ （俄文） Mikhail Meltiukhov, Отчёт Украинского и Белорусского фронтов Красной Армии, p. 367. ^ Rieber, Alfred J. Forced migration in Central and Eastern Europe, 1939–1950. Psychology Press. 2000: 31–33 [19 May 2011]. ISBN 978-0-7146-5132-3. ^ Sanford, George. Katyn and the Soviet Massacre of 1940: Truth, Justice and Memory. ROUTLEDGE CHAPMAN & HALL. 2005: 44 [7 May 2011]. ISBN 978-0-415-33873-8. ^ Simon-Dubnow-Institut für Jüdische Geschichte und Kultur. Shared History, Divided Memory: Jews and others in Soviet-occupied Poland, 1939–1941. Leipziger Universitätsverlag. 2007: 180 [19 May 2011]. ISBN 978-3-86583-240-5. ^ （俄文） Катынь. Пленники необъявленной войны. сб.док. М., МФ "Демократия": 1999, сс.20–21, 208–210. ^ "The Katyn Diary of Leon Gladun", English translation of the Polish document. See the entries on 25 December 1939 and 3 April 1940. ^ 31.0 31.1 31.2 Parrish, Michael. The Lesser Terror: Soviet state security, 1939–1953. Westport, CT: Praeger Press. 1996: 324, 325. ISBN 0275951138. ^ Andrzej Leszek Szcześniak (编). Katyń; lista ofiar i zaginionych jeńców obozów Kozielsk, Ostaszków, Starobielsk. Warsaw, Alfa. 1989: 366. ISBN 83-7001-294-9. , Adam Moszyński (编). Lista katyńska; jeńcy obozów Kozielsk, Ostaszków, Starobielsk i zaginieni w Rosji Sowieckiej. Warsaw, Polskie Towarzystwo Historyczne. 1989: 336. ISBN 83-85028-81-1. , Jędrzej Tucholski. Mord w Katyniu; Kozielsk, Ostaszków, Starobielsk: lista ofiar. Warsaw, Pax. 1991: 987. ISBN 83-211-1408-3. , Kazimierz Banaszek. Kawalerowie Orderu Virtuti Militari w mogiłach katyńskich. Wanda Krystyna Roman, Zdzisław Sawicki. Warsaw, Chapter of the Virtuti Militari War Medal & RYTM. 2000: 351. ISBN 83-87893-79-X. , Maria Skrzyńska-Pławińska (编). Rozstrzelani w Katyniu; alfabetyczny spis 4410 jeńców polskich z Kozielska rozstrzelanych w kwietniu-maju 1940, według źródeł sowieckich, polskich i niemieckich. Stanisław Maria Jankowski. Warsaw, Karta. 1995: 286. ISBN 83-86713-11-9. , Maria Skrzyńska-Pławińska (编). Rozstrzelani w Charkowie; alfabetyczny spis 3739 jeńców polskich ze Starobielska rozstrzelanych w kwietniu-maju 1940, według źródeł sowieckich i polskich. Ileana Porytskaya. Warsaw, Karta. 1996: 245. ISBN 83-86713-12-7. , Maria Skrzyńska-Pławińska (编). Rozstrzelani w Twerze; alfabetyczny spis 6314 jeńców polskich z Ostaszkowa rozstrzelanych w kwietniu-maju 1940 i pogrzebanych w Miednoje, według źródeł sowieckich i polskich. Ileana Porytskaya. Warsaw, Karta. 1997: 344. ISBN 83-86713-18-6. ^ （波兰文） cheko, Polish Press Agency. Odkryto grzebień z nazwiskami Polaków pochowanych w Bykowni. Gazeta Wyborcza. September 2007, (2007-09-21) [2007-09-21]. （原始内容存档于2012-12-21）. ^ （波兰文） Zdzisław J. Peszkowski. Jedyna kobieta - ofiara Katynia （The only woman victim of Katyn）. Tygodnik Wileńszczyzny. 2007, (10) [2007-09-22]. ^ （波兰文） Dmitri Stepanovich Tokariev. Zeznanie Tokariewa. Anatoliy Ablokov, Fryderyk Zbiniewicz. Zeszyty Katyńskie 1426-4064 nr 3: Warsaw, Niezależny Komitet Historyczny Badania Zbrodni Katyńskiej. 1994: 71. , also in Aleksander Gieysztor, Rudolf Germanovich Pikhoya (编). Katyń; dokumenty zbrodni. Wojciech Materski, Aleksandra Belerska. Warsaw, Trio. 1995: 547–567. ISBN 83-85660-62-3. ^ See for instance: （波兰文） Barbara Polak. Zbrodnia katyńska (PDF). Biuletyn IPN. 2005: 4–21 [2007-09-22]. ^ Simon Sebag Montefiore. Stalin: The Court of the Red Tsar. Knopf, 2004. ISBN 978-1-4000-4230-2 p. 334: "He brought a butcher's leather apron and cap which he put on when he began one of the most prolific acts of mass murder by one individual, killing 7,000 in precisely twenty-eight nights, using a German Walther pistol to prevent future exposure." ^ Brackman, Roman. "The Secret File of Joseph Stalin: A Hidden Life", p. 358, Routledge, 2001; ISBN 978-0-7146-5050-0. ^ （波兰文） Barbara Polak. Zbrodnia katyńska (PDF). Biuletyn IPN. 2005: 4–21 [2007-09-22]. ^ Engel, David. "Facing a Holocaust: The Polish Government-In-Exile and the Jews, 1943–1945". 1993. ISBN 978-0-8078-2069-8. ^ 49.0 49.1 49.2 Davies, Norman. "Europe: A History". HarperCollins, 1998. ISBN 978-0-06-097468-8. ^ The report can be found in pro-Soviet publication Supplement to Russia at war weekly （1944）; it is also printed in Dr.Joachim Hoffmann's book Stalin's Annihilation War 1941–1945 （original: Stalins Vernichtungskrieg 1941–1945）. 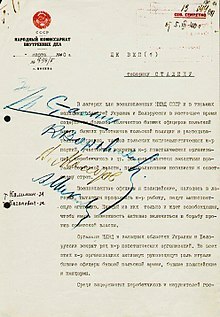 Full text of the original report as printed in "Pravda" on January 26, 1944 is available at the Russian Wikisource. ^ Churchill, Winston, The Hinge of Fate, 1986 （1950）, ISBN 978-0-395-41058-5. ^ 58.0 58.1 National Archives and Records Administration, documents related to Committee to Investigate and Study the Facts, Evidence, and Circumstances of the Katyn Forest Massacre （1951–52） online, last accessed on 14 April 2010. Also, Select Committee of the US Congress final report: "The Katyn Forest Massacre," House Report No. 2505, 82nd Congress, 2nd Session （22 December 1952） online pdf 互联网档案馆的存檔，存档日期2006-02-09., unofficial reproduction of the relevant parts. ^ Van Vliet Report （reconstructed and discussion of） 互联网档案馆的存檔，存档日期2009-12-07.. Retrieved 19 December 2005. ^ Montréal Gazette, Canada, 5 November 1990. "Germans Hanged for Katyn" and Letter published in Anzeiger der Notverwaltung des Deutschen Ostens, No.5, Sept./Oct. 2005 互联网档案馆的存檔，存档日期2009-12-02.., Retrieved on 16 November 2006. 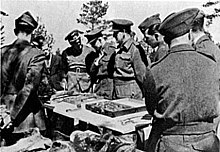 ^ （俄文） I.S.Yazhborovskaja, A.Yu.Yablokov, V.S.Parsadanova, Катынский синдром в советско-польских и российско-польских отношениях, Moscow, ROSSPEN, 2001, pp. 336, 337. ^ Excerpts of Nuremberg archives: Nizkor.org – Fifty-Ninth Day: Thursday, 14 February 1946 （Part 7 of 15）. Retrieved 2 January 2006. ^ As described by Iona Nikitchenko, one of the judges and a military magistrate having been involved in Stalin's show trials, "the fact that the Nazi chiefs are criminals was already established [by the declarations and agreements of the Allies]. The role of this court is thus limited to determine the precise culpability of each one [charged]". in: Nuremberg Trials, Leo Kahn, Bellantine, N.Y., 1972, p.26. ^ Coatney, Louis Robert. The Katyn Massacre （A Master of Arts Thesis）. Macomb: Western Illinois University. 1993. ^ Schemann, Serge. SOLDIERS STORY' SHARES PRIZE AT MOSCOW FILM FESTIVAL. The New York Times (New York Times). July 1985: 10 [2010-04-14]. ^ "Judgment On Katyn". Time, 13 November 1989. Retrieved on 04 August 2008. ^ （波兰文） Encyklopedia PWN, 'KATYŃ'. Retrieved on 14 April 2010. ^ （俄文） proposal online. Retrieved 19 December 2005. 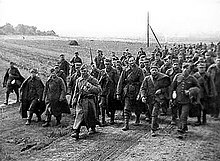 ^ POLISH-RUSSIAN FINDINGS ON THE SITUATION OF RED ARMY SOLDIERS IN POLISH CAPTIVITY （1919–1922）. Official Polish government note about 2004 Rezmar, Karpus and Matvejev book. Retrieved 20 February 2008. ^ Radio Free Europe, ...DESPITE POLAND'S STATUS AS 'KEY ECONOMIC PARTNER 互联网档案馆的存檔，存档日期2008-03-02., Newsline Wednesday, 29 September 2004 Volume 8 Number 185. Retrieved 2 January 2006. ^ Guardian Unlimited, "Russian victory festivities open old wounds in Europe", 29 April 2005, by Ian Traynor. Retrieved 31 January 2009. ^ （波兰文） Kaczmarski, Jacek. "Katyń 互联网档案馆的存檔，存档日期2006-10-15.". kaczmarski.art.pl, 29 August 1985. Retrieved on 05 August 2008. ^ Balto. indie gets Emmy nod. Mddailyrecord.com. 2001-05-22 [2010-03-19]. ^ Easton, Adam. Russia's Putin invites Tusk to Katyn massacre event. BBC News. 2010-02-04 [2010-03-19]. ^ 俄总理普京谴责苏联掩盖卡廷森林惨案真相. 网易新闻 (网易). 9 April 2010 [10 April 2010]. ^ Katyn Commemorations Mark ‘Turnaround’, The Moscow Times. ^ Polish President Lech Kaczynski dies in plane crash. BBC News (BBC). 10 April 2010 [10 April 2010]. 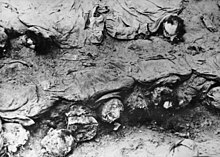 ^ Russian parliament admits Stalin ordered Katyn massacre. RFI (RFI). 26 November 2010 [26 November 2010]. 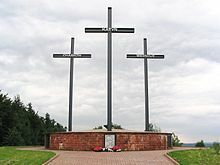 ^ "Picture and story of Monument, Cannock Chase"
^ "National Katyn Memorial Foundation 互联网档案馆的存檔，存档日期2008-03-06.". National Katyn Memorial Foundation, 08 October 2005. Retrieved on 04 August 2008. ^ "Photo of Detroit Memorial 互联网档案馆的存檔，存档日期2009-11-21." ^ Katyn Memorial in Jersey City.